Hello there! I'm Jen. Nice to meet you! I'm a full-time yoga teacher and student, living and working in New York City with my adoring husband and our two cats. I retired from my fancy day job in advertising so I could play at yoga all day long, and it is going swimmingly, thanks for asking! I teach and work in operations at Prana Power Yoga in Union Square and Carroll Gardens and I.AM.YOU Studio in SoHo - check out the Yoga tab above for current teaching schedule. I consider myself to be a very lucky lady on all counts. 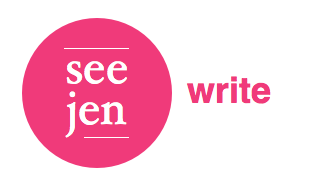 See Jen Write is a collection of my thoughts on life, yoga and the shiny moments that catch my eye. Thank you very kindly for reading.